This Norwegian doom cult was formed in 1991/92 from the ashes of Blackened. 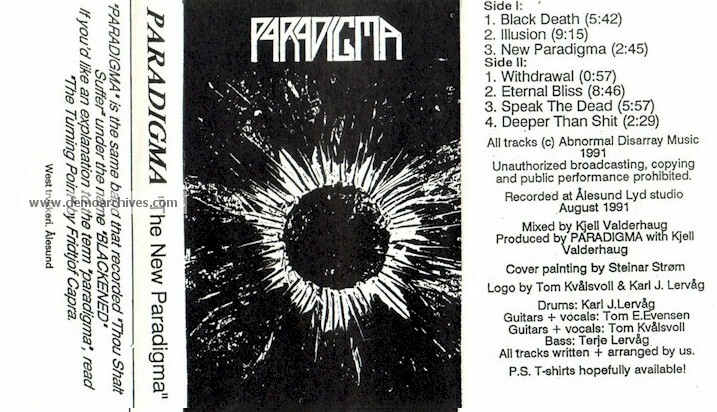 At the time, Paradigma’s multivoiced doom/death blend proved a fresh breath of putrefaction. Albeit emotional and melodic, Paradigma still avoids the sickening over-sweet romantic aura which some doom bands reek of. Rather the opposite, Paradigma has an expression channelling anger and hatred just as well as sorrow or passion. The demo tape ‘As Autumn Dies’ was recorded in 1993, followed by the CD Mare Veris in 1995 and the MCD Skadi in 1996. The band never went on tour, but still managed to play more than 50 gigs in total. Pro printed 4 panel glossy covers. 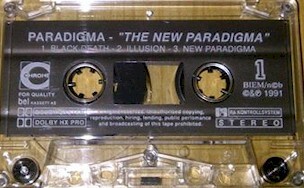 Printed tapes. Lyrics on back.